GST or goods and services tax finally saw the light of the day, with the new tax system launched at a function in Central Hall of Parliament on Friday midnight. GST, which embodies the principle of "one nation, one tax, one market" is aimed at unifying the country's $2 trillion economy and 1.3 billion people into a common market. Before the much-awaited GST became a reality, various departments had come out with various publications guidelines in their bid to simplify a transition into the new indirect taxation system. Traders, businessmen, manufacturers and suppliers alike are gearing up for a successful migration under GST. The Central Board of Excise and Customs, under the purview of the Department of Revenue, has come out with answers to a wide variety of frequently asked questions by industry. It has touched a variety of topics from GST registration to input tax credit to excise credit to point of tax to Special Economic Zones. Besides, in the digital world today, the CBEC has opened many lines of communication for addressal of GST-related queries. GSTN or GST Network, in partnership with tech majors Infosys and Tech Mahindra, has set up two dedicated call centres to support taxpayers and tax officials with regard to this transition. 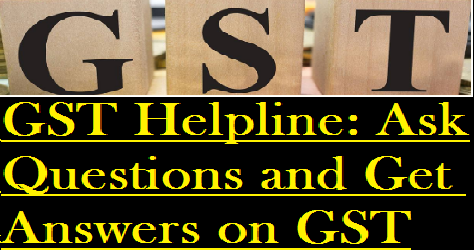 One helpline - 0120-4888999 - is for taxpayers while another - 0124-4479900 - provides support to tax officials, according to GSTN, a special purpose vehicle set up primarily to provide IT infrastructure and services for GST implementation.